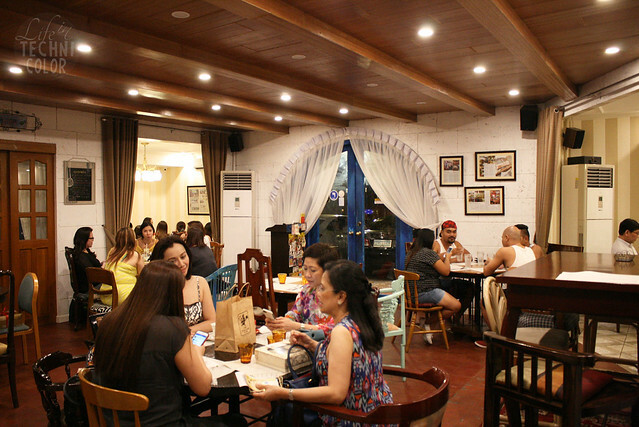 One of Quezon City's most loved restaurants! 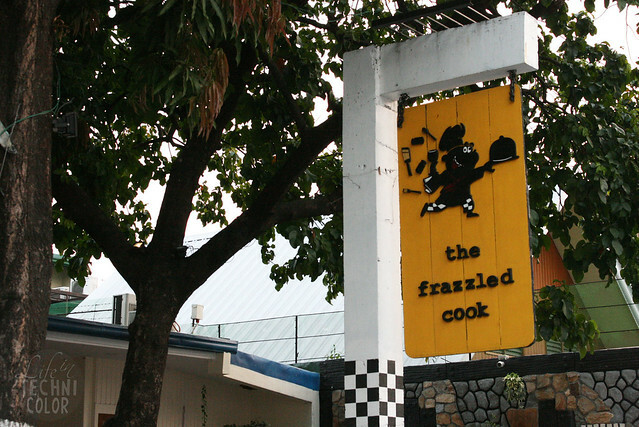 It was actually my second time at The Frazzled Cook. 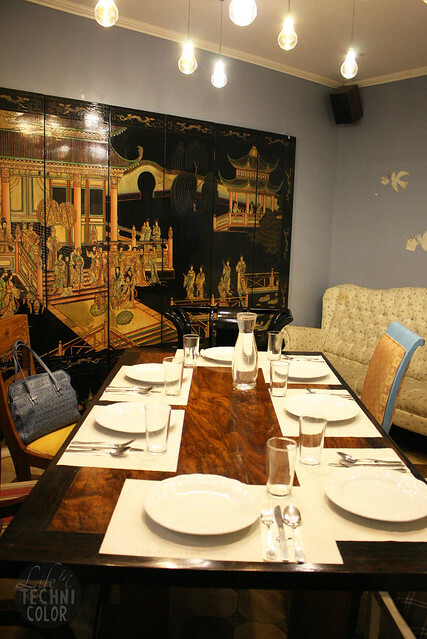 Seven months ago, I dined here with my family and honestly, it wasn't what we expected. I mentioned in my post last October how some dishes lacked flavor, but I said I'd give them another chance someday. That day finally came, and I gotta say, the food has significantly improved! My friends and I were supposed to meet at 6:30pm, but since I was coming from work, I arrived for dinner an hour early (haha!) 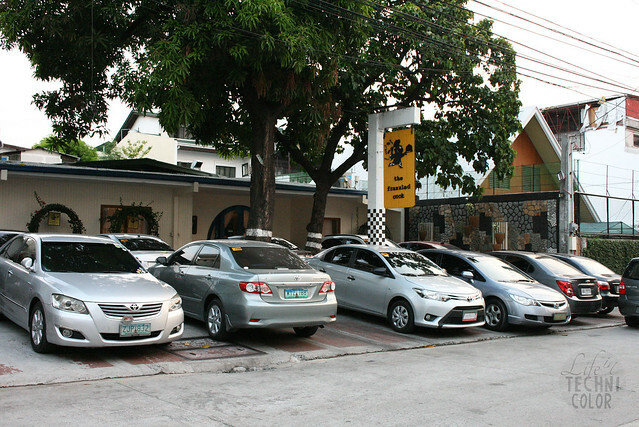 The photo above was taken around 5:45pm, and as you can see, parking was already full way before dinner time! I ended up parking on the street, which I didn't mind at all. At least I didn't have to worry about moving my car whenever someone had to leave. 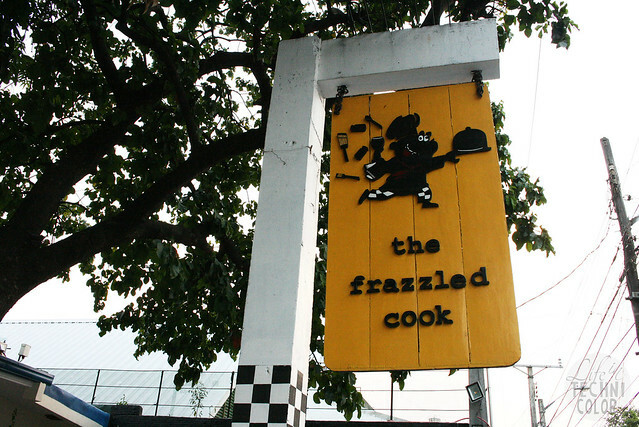 The Frazzled Cook is not a new restaurant, but it is new to Quezon City. 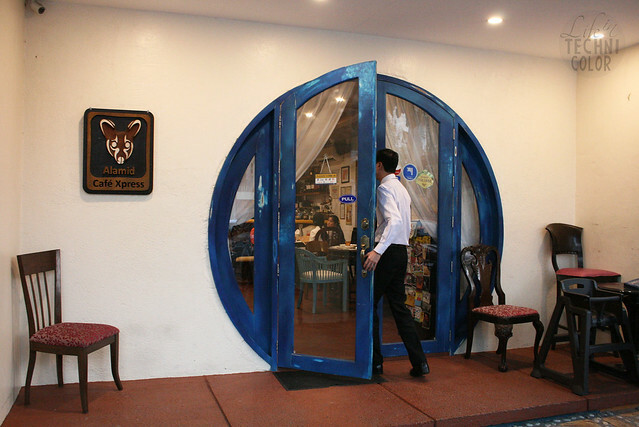 They first opened along Luna Mencias Street, Mandaluyong in 2009, closed five years later, then reopened at Scout Gandia in May 2015. 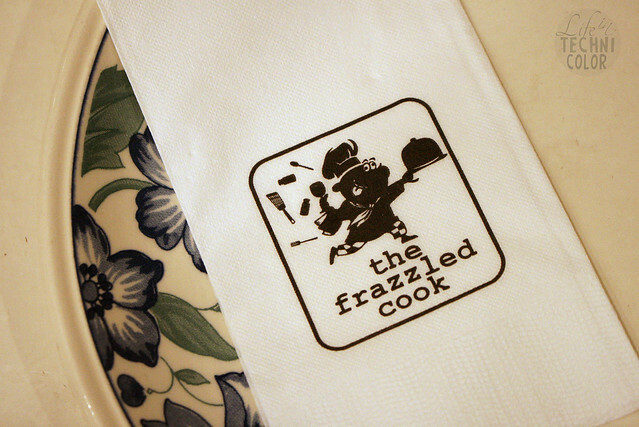 They came up with the name The Frazzled Cook, because when they were just starting, the chef wasn't just the chef. He was also in charge of the design, purchasing, etc. It was pretty much an all-around job, so you can imagine how exhausting that must've been. "I'm so frazzled," he said. And that's how The Frazzled Cook came to be. P.S. 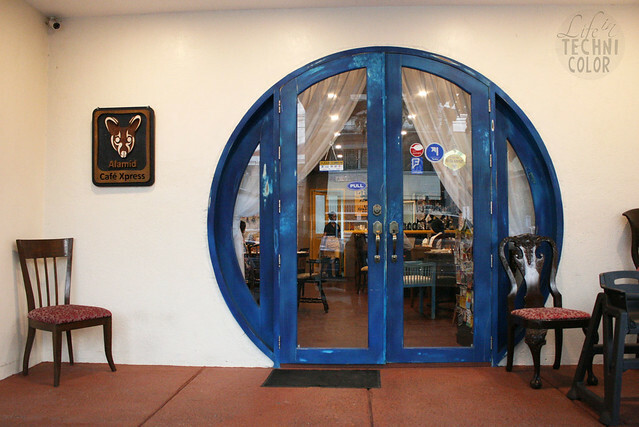 How cute is their door?? We couldn't resist having our picture taken in front of it! 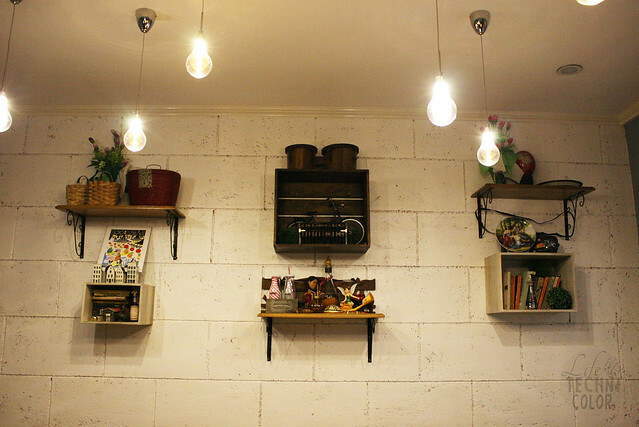 The interiors are very homey - from the warm lighting to the plates hanging on the walls. Each chair is different, which only adds to its charm. The trinkets displayed are from the owners' various travels around the world. 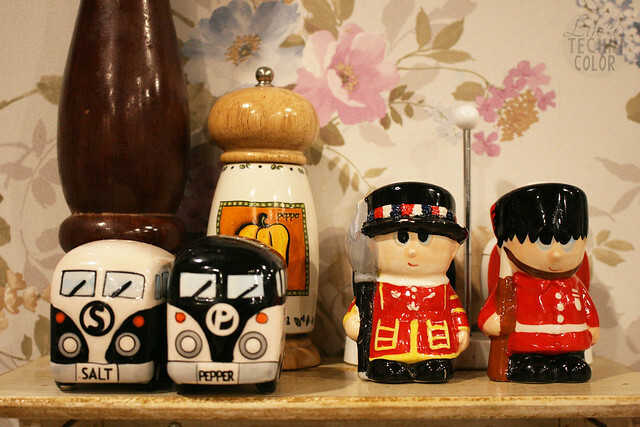 From the salt and pepper shakers to the books to the random figurines, they all come from personal collections. I personally felt like I was having dinner at home, without the hassle of cooking and cleaning up! Haha! 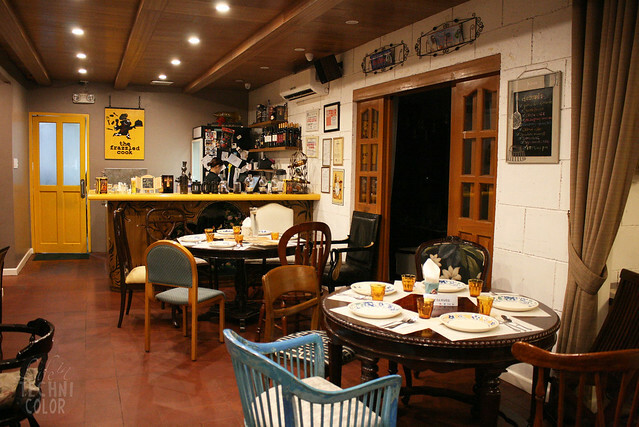 They have private rooms for small gatherings, but the whole restaurant is available for bookings as well. 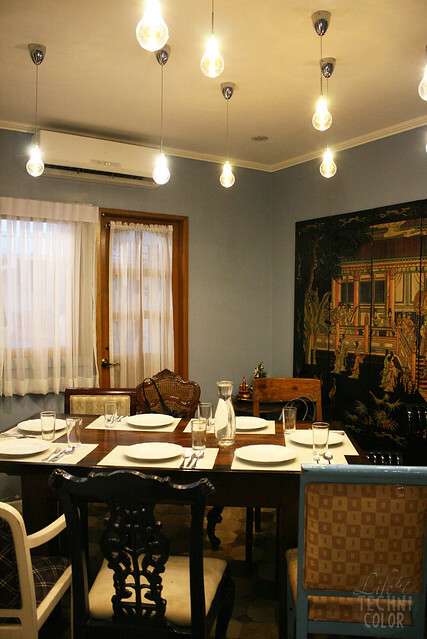 For example, this room has a consumable amount of P5,000 and is good fo 8 pax. It even has a couch, so you can chill there before dinner starts. 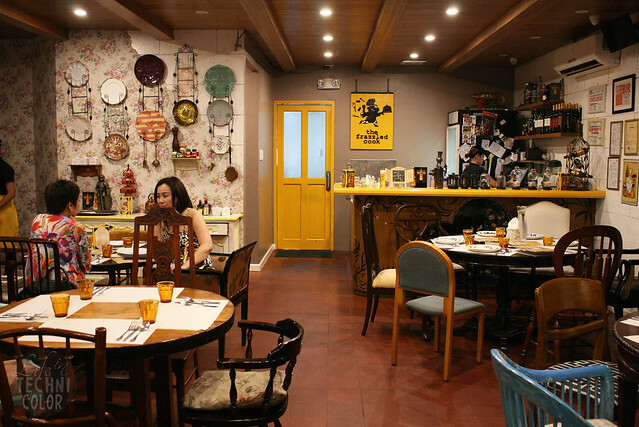 The Frazzled Cook has a wide menu that's all about continental cuisine with a Filipino feel. 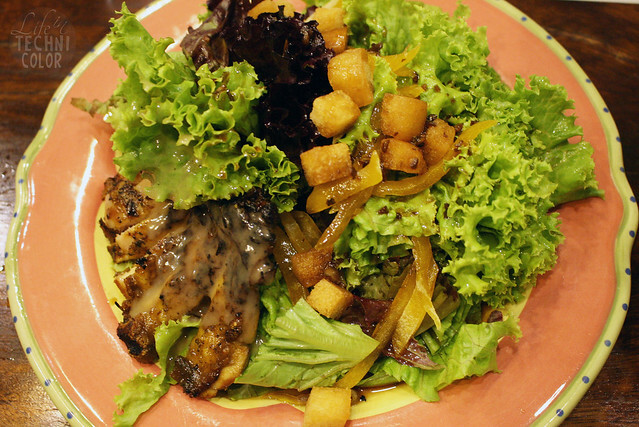 The Frazzled Cook's Herbed Chicken Salad is loaded with crisp greens with strips of mangoes, generous size of chicken, and homemade croutons with basil vinaigrette. 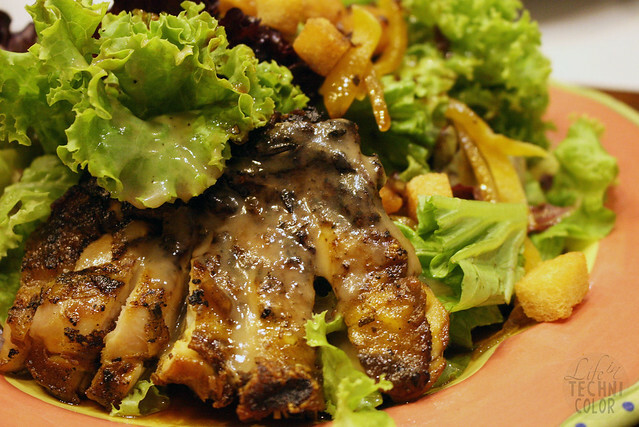 Most people may consider the highlight here to be the chicken, but for me, it's the vinaigrette, so make sure to mix it well before serving. 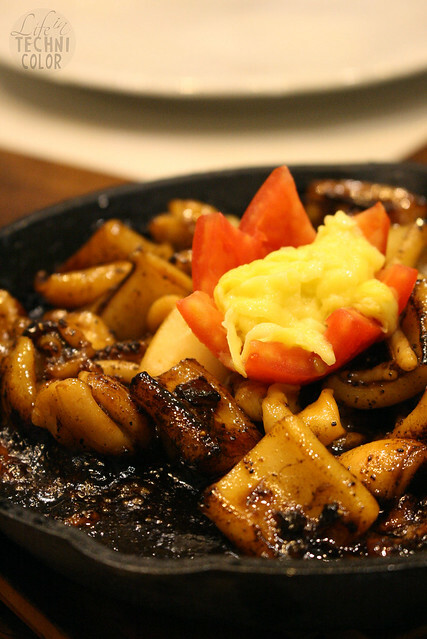 There's just something about dishes served on a hot plate that makes it more appetizing to eat. Don't you agree? This one deserves its rightful spot at The Frazzled Cook's bestsellers list. 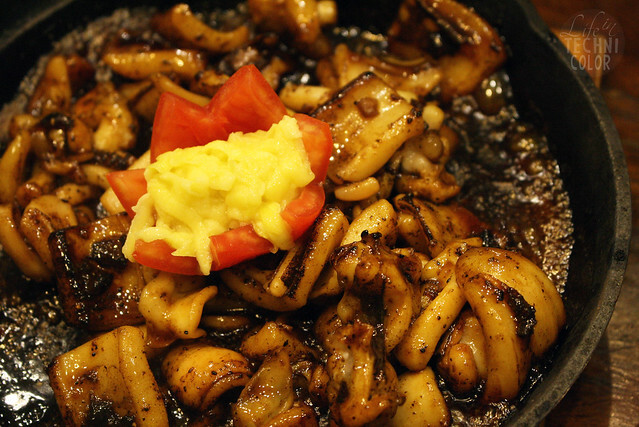 Marinated squid with cured mangoes and drizzled vinaigrette - you can't miss it! The last time we ate here, we had the Tenderloin and Sausage Pizza which was very meaty; the Pizza Caprese is much simpler in comparison. 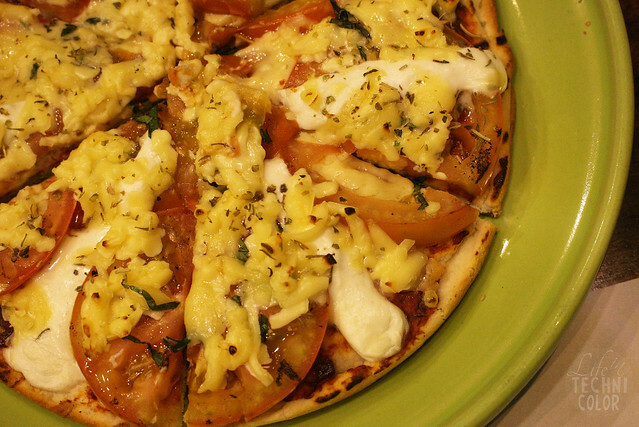 Imagine a Filipino version of margherita pizza - freshly grilled tomatoes and kesong puti on a herbed crusted thin pizza dough. 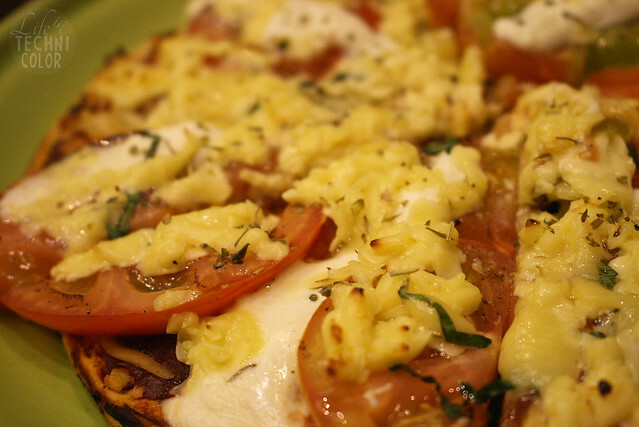 Drizzle with some garlic oil and you're all set. My kind of pizza. 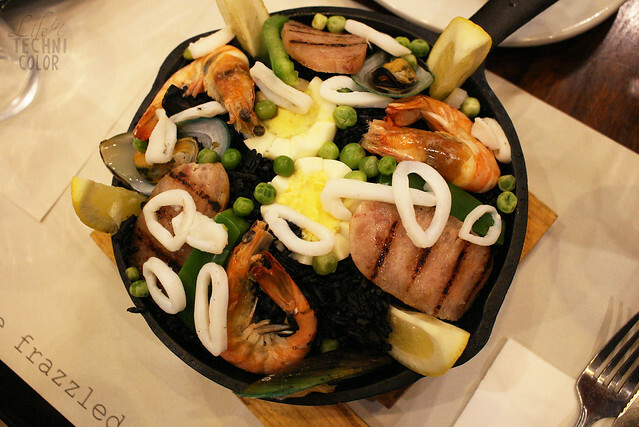 We were told that not a lot of people order this, and that's unfortunate because it's a really good dish. 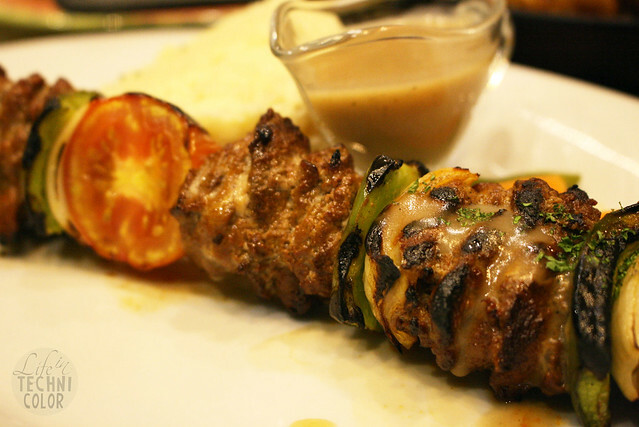 Every piece of beef is tender, and unlike in Mediterranean restaurants, it comes with gravy (rather than yogurt sauce). 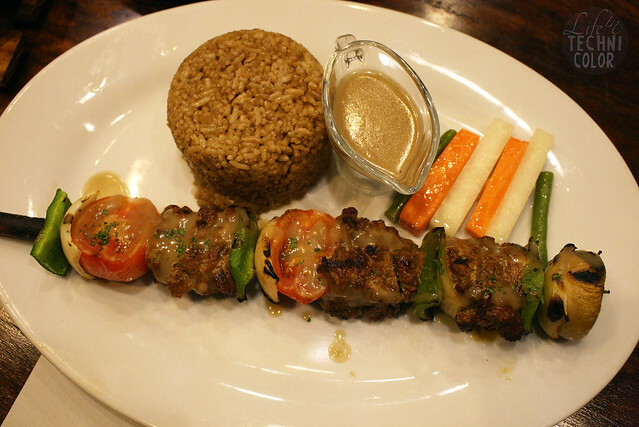 You can even choose to have it with either rice or mashed potatoes. 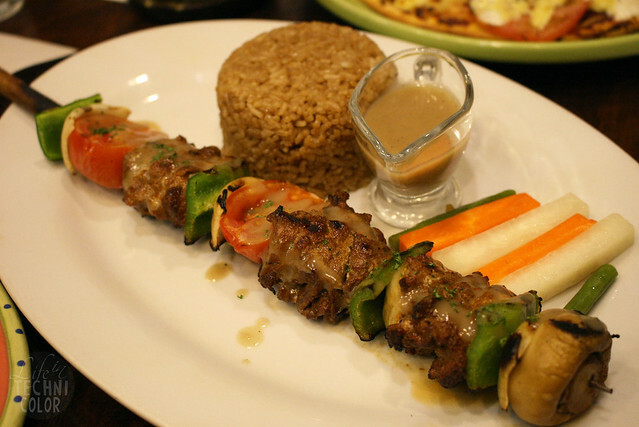 The serving looks small, but once you take everything out of the stick, you'll find that there's really more than enough meat for one. 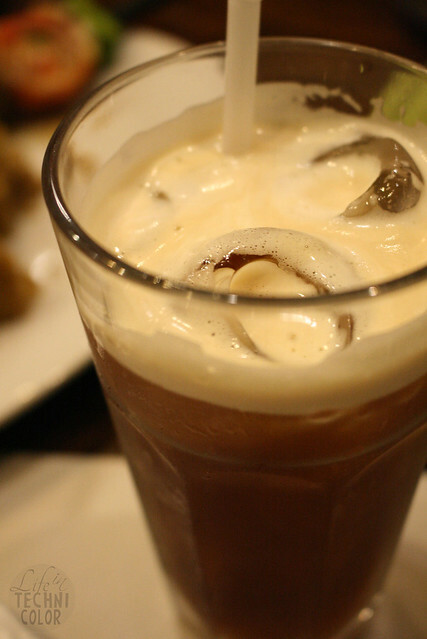 I didn't get to try this the last time and after tasting it, I'm definitely ordering it again on all my next visits. 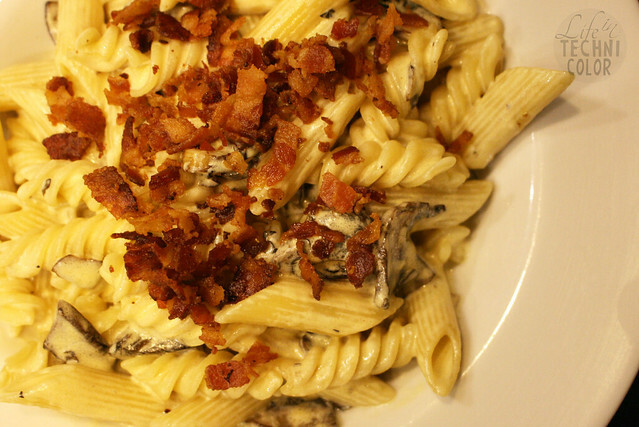 For me, truffle pasta is an easy hit or miss, and I've had so many misses that I've actually learned to avoid ordering it. This one, though, hits the bullseye. The homemade truffle sauce is the best! 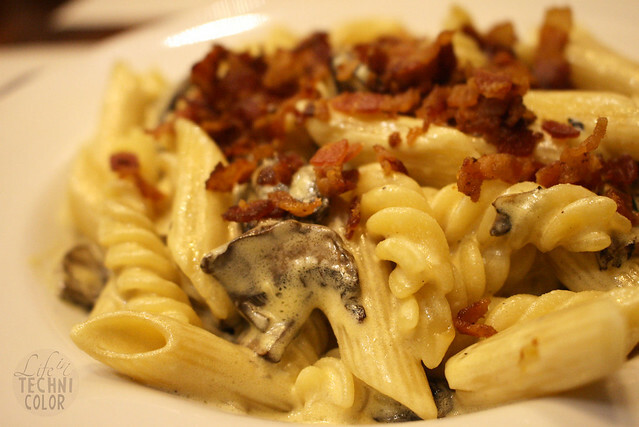 I just wish it came with less bacon and more portobello mushrooms, but that's just me. 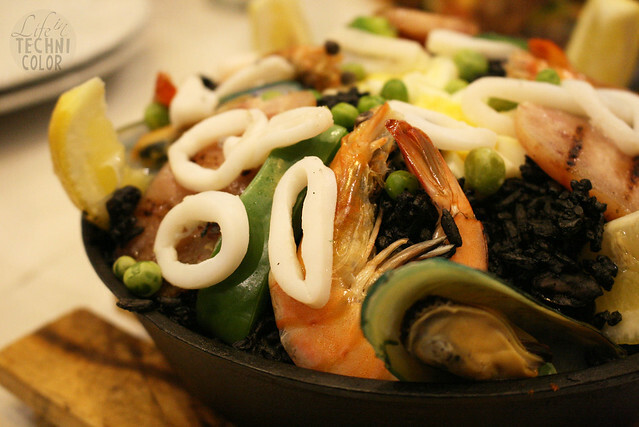 Unlike the one I tried six months ago, this version of their Paella Negra is delectable. It was served al dente and thin; the rice has absorbed most of the sauce, so it's packed with lots of flavor and doesn't come out dry at all. 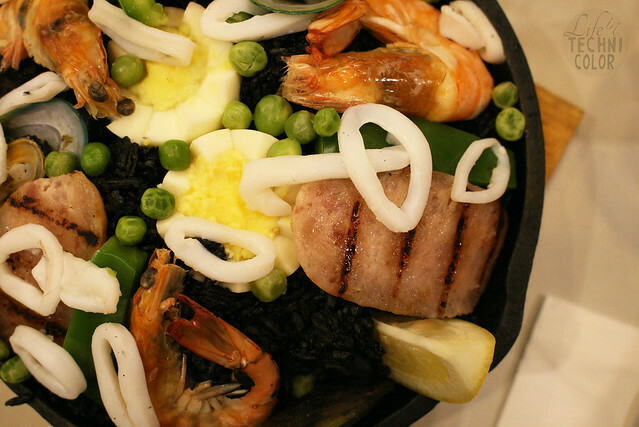 Some people like their paella with lemon juice, so if you're one of them, go ahead and squeeze some over it. 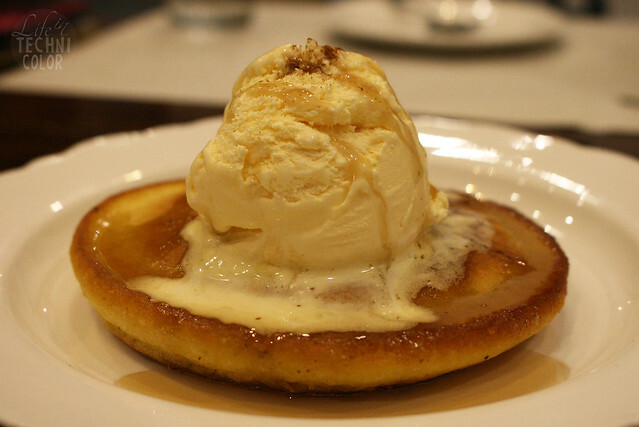 For dessert, we had the Pancake ala Mode which they make on the spot. It can take a while since it's thicker than the usual pancake, but I am telling you, it is worth the wait. 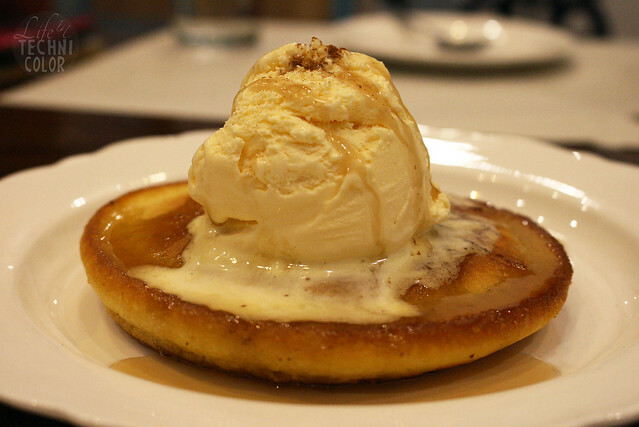 The warm pancake is perfect against the cool mantecado ice cream that is then drizzled with cinnamon and caramel syrup. This dish comes out crunchy on the outside and soft in the middle. The scene at 9pm. Still full!